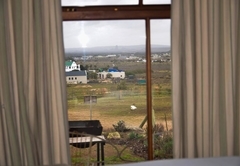 The Stables Langebaan is a highly recommended property providing self catering in Langebaan for tourists visiting the Cape West Coast region. 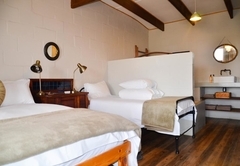 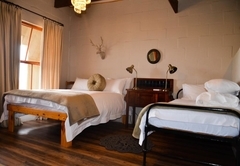 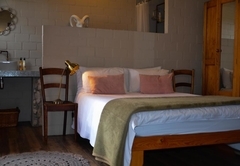 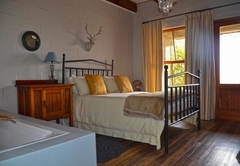 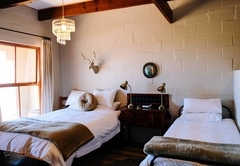 The Stables are two rustic, vintage-feel cottages situated in Longacres just outside Langebaan. 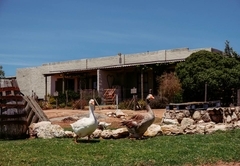 The cottages have their own lawned yard complete with buck, chickens, geese and ducks! 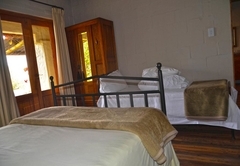 The units offer peace and quiet in a farm environment. 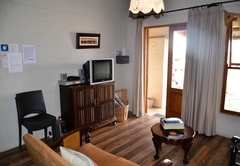 The self catering cottages each have one bedroom with a bathroom, an open plan living area and kitchen that leads out to a small stoep and maintained lawn. 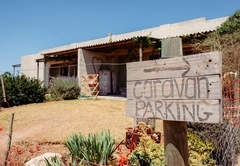 There is also a caravan for those guests who only needs a one night stay (or more) and a comfortable night sleep with a nice morning cup of coffee before on the road again. 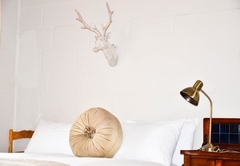 Equipped with the basic eat-ware and appliances. 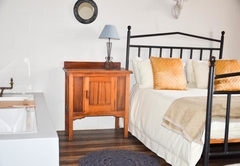 The units are fully equipped for up to six guests. 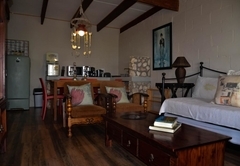 The cottages also have full DStv and complimentary Wi-Fi. 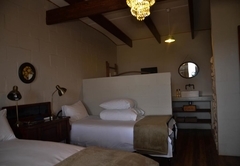 The bedrooms have one double and one single bed and the lounge area also has a daybed to sleep an extra guest. 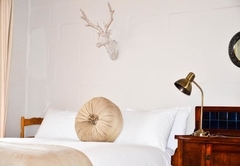 Crisp white linen and extra blankets (for chilly winter evenings) are supplied. 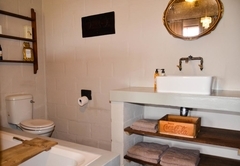 There is an open bathroom which has both a shower and bath. 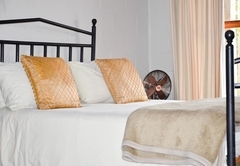 Towels are supplied but please bring your own beach towels. 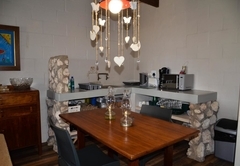 The kitchen is fully equipped for self catering; all utensils, even pasta spoons are provided. 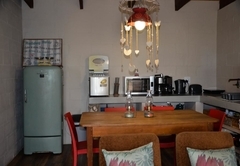 Other kitchen facilities also include also a coffee percolator for the fresh morning coffee, a fridge, washing machine and iron. 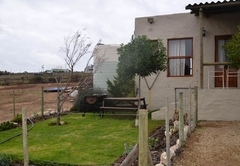 Both units are supplied with a portable braai and grid. 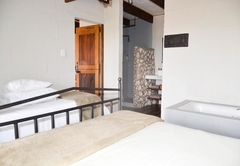 Braai wood is available on request and a grid, brush, fork, tongs and square roaster are supplied. 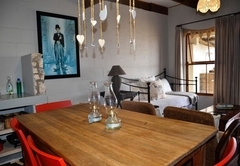 The outside area is furnished with an outdoor side table and chairs. 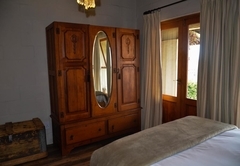 The Vintage Queen Caravan is for those guests who only needs a one night stay (or more) and a comfortable night sleep with a nice morning cup of coffee before on the road again. 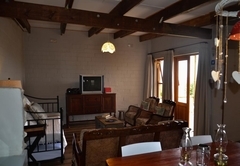 Equipped with the basic eat-ware and appliances. 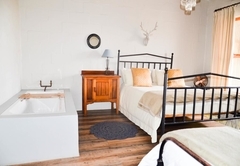 The cottage has one bedroom (double & single bed), with open bathroom and open plan living area (daybed with under bed), a kitchen leading out to a little stoop to the maintained lawn. 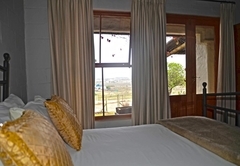 Equipped with linen, towels, free Wi-Fi, hotel package DSTV. 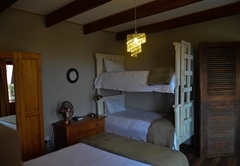 The cottage has one bedroom (double & bunk bed), with open bathroom, open plan living area (daybed with under bed), a kitchen leading out to a little stoop to the maintained lawn. 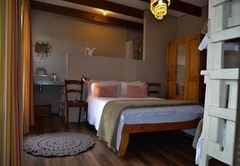 It is fully equipped with linen, towels, free Wi-Fi, hotel package DSTV. 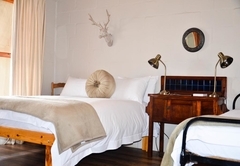 A lovely rustic atmosphere, comfortable, warm and decorated with style and quality. 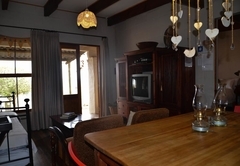 We loved the little cottage and would like to return soon. 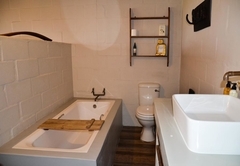 Very conveniently positioned, private, and easily accessible. 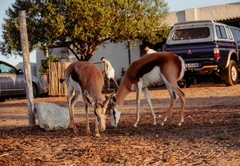 The farm animals and visiting springbok made the visit even more special. 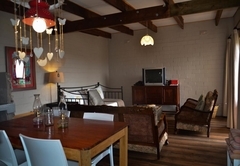 Response timeThe Stables Langebaan typically responds to requests in 5-10 minutes.